Dedicated to those who served our country in all wars. For the glory of God and American independence. Erected by The citizens of Alatmont, N.Y. Location. 42° 42.062′ N, 74° 1.941′ W. Marker is in Altamont, New York, in Albany County. Marker is on Main Street. Touch for map. Marker is in this post office area: Altamont NY 12009, United States of America. Touch for directions. Other nearby markers. At least 8 other markers are within walking distance of this marker. Orsini Park (within shouting distance of this marker); Altamont Free Library (within shouting distance of this marker); Home Front Cafe (within shouting distance of this marker); Altamont (about 300 feet away, measured in a direct line); Inn of George Severson (about 400 feet away); Beebe Harness Shop (about 500 feet away); Fire Department/Village Hall (about 500 feet away); Enterprise Building (about 600 feet away). Touch for a list and map of all markers in Altamont. More. Search the internet for Dedicated. Credits. This page was last revised on March 28, 2019. 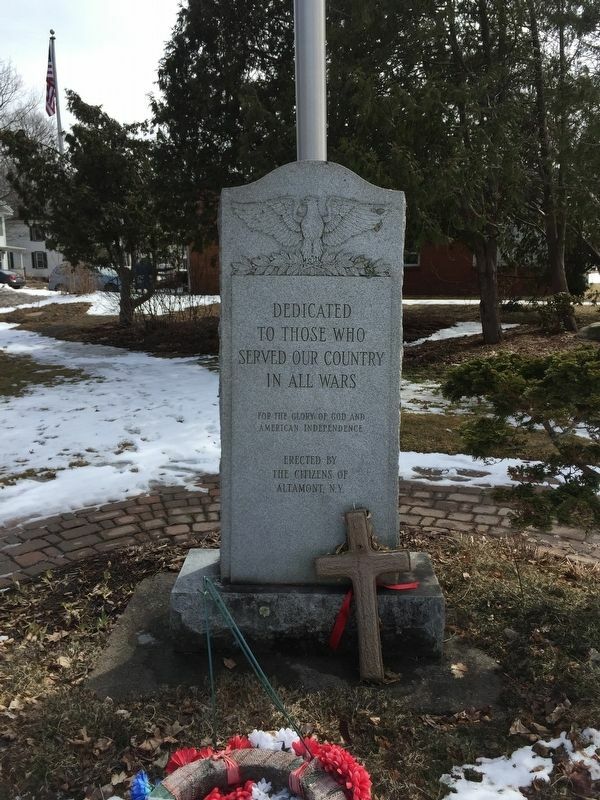 This page originally submitted on March 26, 2019, by Steve Stoessel of Niskayuna, New York. This page has been viewed 78 times since then. Photo 1. submitted on March 26, 2019, by Steve Stoessel of Niskayuna, New York. • Bill Pfingsten was the editor who published this page.